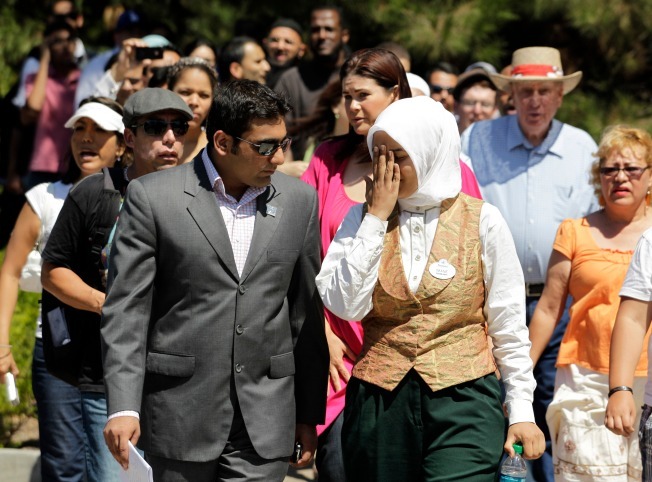 Imane Boudlal, right, a Muslim woman who works as a hostess at a Disneyland restaurant, covers her face as she leaves Disney's Grand Californian Hotel with civil rights coordinator Affad Shaikh, left, after she was denied by her employer in Anaheim, Calif., Wednesday, Aug. 18, 2010. Boudlal claims her employer sent her home without pay after she refused to remove her head scarf in front of customers. The anti-Muslim sentiment seen across the nation in opposition to mosque building and even a Florida pastor's threat to burn the holy book of Islam, the Quran, increasingly is showing up at the workplace. Claims of discrimination against Muslim workers — which spiked immediately after 9/11 and then dissipated — are showing signs of resurgence. “There is a hatred, an open hatred, and a lack of tolerance for people who are Muslim,” said Mary Jo O’Neill, regional attorney for the Phoenix district office of the Equal Employment Opportunity Commission. She said she has seen an uptick in discrimination complaints among Muslim workers in her region, which includes Arizona, Colorado, Wyoming, Utah and New Mexico. Claims of bias against Muslims in the workplace rose to 1,490 last year from 1,304 in 2008 and just 697 in 2004, according to EEOC figures. Last year's total was even higher than in the year after the 9/11 attacks, when bias claims hit 1,463. Figures from this year are not yet available. A poll released last month by the Pew Research Center that shows that the public’s view of Islam has deteriorated, with only 30 percent of Americans expressing a favorable opinion of Islam, compared with 41 percent in 2005. “One can easily conclude that since the general situation is so unfavorable when it comes to Muslims that this negative idea is carried into the workplace,” said Shams Inati, a professor at the Center for Arab and Islamic Studies at Villanova University. One particularly disturbing case O’Neill is involved in is an EEOC suit against meatpacking company JBS Swift & Co. The suit claims the company discriminated against Somali and Muslim employees at its headquarters in Greeley, Colo., and another one of its facilities in Grand Island, Neb. The suit alleges a pattern of discrimination and a failure to accommodate the workers’ religious requirements for prayer breaks. The charges also include a series of abusive behavior among JBS employees. “Managers, supervisors, and other employees regularly threw blood, meat, and bones at the Somali and Muslim employees,” the EEOC suit alleges. “There was offensive anti-Somali, anti-Muslim and anti-Black graffiti present in the restrooms." JBS officials did not respond to a request for comment on the suit. Another case making headlines involves a Disney hotel hostess in California who supposedly was sent home last month because she refused to take off her hijab, an Islamic headscarf. Disney spokeswoman Suzi Brown said the worker, Imane Boudal, 26, was offered the option of working away from public view or wearing headwear the company thought would more appropriately fit in the theme of its hotel. “She’s chosen, over and over again, to reject all the options presented to her,” Brown said. Hiding a worker’s religious displays from public view because an employer is fearful how customers will perceive them is not allowed under the nation’s labor laws, legal experts said. “You can’t say to a receptionist, ‘I don’t want you wearing headgear because it drives customers away,’” if the attire is religiously based, said Danielle Urban, an employment attorney with Fisher & Phillips in Denver. Decisions on what an employer can legally forbid are based on whether the request from an employee is reasonable and can be accommodated, she explained. If wearing a headscarf is a safety issue on a production line, for example, then an employer may be allowed to bar such scarves. “But it’s not a reasonable request to honor someone else’s bigotry,” she added. Urban said she has been getting calls lately from employers asking about worker attire, including things like tattoos and piercing that workers claim are part of their religions or national origin. She also got a call from a car dealership last year asking about an employee who had converted to Islam and started wearing a hijab. “They wanted to move her to the back. They were worried about what their customers would think,” said Urban, who advised the employer not to move her. The Muslim community is taking steps to quell some of the bias. A coalition of Muslim Americans, under the name MyFaithMyVoice, produced a public service announcement this month including average Muslim Americans in a cacophony of voices asking Americans not to fear them. To Villanova’s Inati, the PSA shows how desperate American Muslims are to do something to stop the escalating bias.